According to Theravada canonical texts, pursuing this training leads to the abandonment of lust, hatred, and delusion. One who is fully accomplished in this training attains Nibbana. 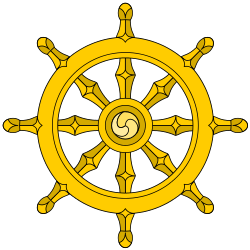 In the Anguttara Nikaya, training in "higher virtue" includes following the Patimokkha, training in "higher mind" (sometimes simply referred to as "concentration") includes entering and dwelling in the four jhanas, and training in "higher wisdom" includes directly perceiving the Four Noble Truths. In several canonical discourses, a more "gradual" instruction (anupubbikathā) is provided to receptive lay people (see also, gradual training). This latter instruction culminates in the teaching of the Four Noble Truths which in itself concludes with the Noble Eightfold Path, the constituents of which can be mapped to this threefold training (see below). ↑ See AN 3:88 (Thanissaro, 1998a). ↑ See AN 3.89 (Thanissaro, 1998b). Nyanaponika Thera and Bhikkhu Bodhi (trans. and ed.) (1999). Numerical Discourses of the Buddha: An Anthology of Suttas from the Anguttara Nikaya. Walnut Creek, CA: Altamira Press. ISBN 0-7425-0405-0. Thanissaro Bhikkhu (trans.) (1998a). AN 3.88: Sikkha Sutta - Trainings (1). Available on-line at http://www.accesstoinsight.org/tipitaka/an/an03/an03.088.than.html. Thanissaro Bhikkhu (trans.) (1998b). AN 3.89: Sikkha Sutta - Trainings (2). Available on-line at http://www.accesstoinsight.org/tipitaka/an/an03/an03.089.than.html. Thanissaro Bhikkhu (trans.) (1998c). MN 44: Culavedalla Sutta: The Shorter Set of Questions-and-Answers. Available on-line at http://www.accesstoinsight.org/tipitaka/mn/mn.044.than.html. "Threefold Training", talk by Mahasi Sayadaw.